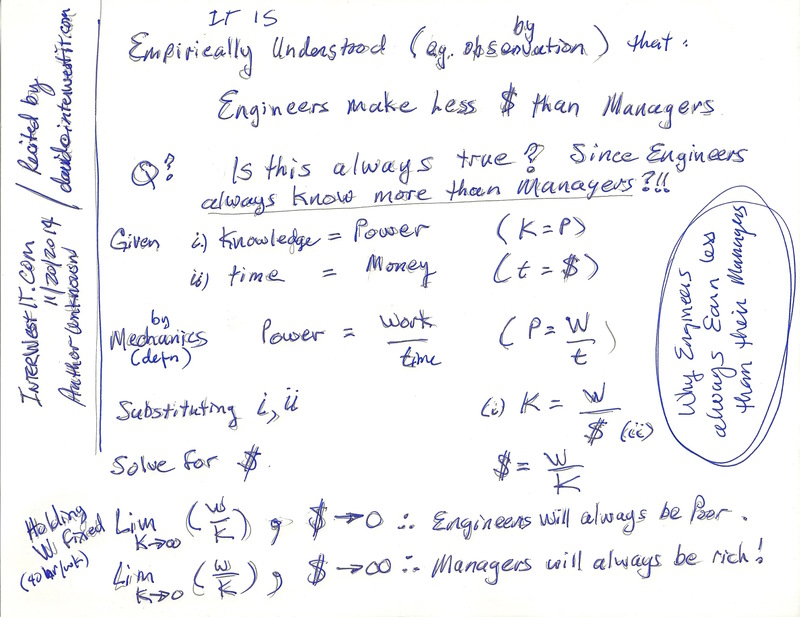 Back of the napkin proof: Why Engineers will always earn less than Managers. Finally, mathematical proof that highly trained Engineers with knowledge across many disciplinary boundaries — will always earn less than management. Understanding the proof requires a “pre-calculus’ understanding of basic math. This of course implies that managers, no matter how hard they try can ever actually understand what we’re saying. Posted in Disruption, Internet, Tech News, WebPresence.Tagged Calculus, Engineer, Manager, Math, Mathematical Proof, Money, Power, Proof, Time. Previous Post Deal A Story Cards … Product marketing Campaign set to launch. Next Post Why operate an Anchor Website in your Web Presence?